There’s little question that iOS 7 is the most transformative update to iOS in its six-year history. It’s not just about the flat design. The first time I laid hands on the new operating system, I felt like I had a new phone, one that looked prettier and, more importantly, felt more useful. Opening each app and poking around felt kind of like walking into my apartment after some talented interior designer had given it a floor-to-ceiling renovation. But again, that implies that iOS 7 is just about looks. There’s more functionality here, too, especially from the do-it-all Control Center and the overhauled Camera app. The biggest impact iOS 7 had, though, is that I found myself using my phone more. It was fun. A complete redesign of Apple’s iOS for iPhone, iPod touch, and iPad. It will dictate how you interact with Apple’s mobile devices for years to come. One thing is definite: iOS 7 is the face of Apple for the foreseeable future. You don’t have to buy into it if you don’t want to, but it’s not going away, either. And growing pains aside, it really is quite nice. That said, just because something looks pretty doesn’t mean it works well. And more feature list is only as good as how those features actually perform. An update as comprehensive as iOS 7 is bound to alienate some users. The bright bubblegum colors and gentle gradients aren’t for everyone, nor is the lack of buttons and textures. If the redesign is comprehensive enough to feel like a new phone, it’s also radical enough to feel a little disorienting, like driving down an unfamiliar road in a familiar forest. There’s a distinct emphasis on speed and usability in iOS 7, but it comes at the expense of comfort sometimes. Android users should be okay though; iOS 7 definitely has a similar look and feel to what they’re used to. iOS 7 is a redesign in every sense of the word. The most noticeable and talked about change is the death of skeuomorphism and the beginning of Apple’s take on flat design. Gone are the dimensions and simulated depth of all previous versions of iOS; clean lines and bright colors take over with impressive agility. As dramatic as the change in look and feel is, you’ll be surprised by how quickly you get used to it. While the app icons are getting all the attention, the real magic behind iOS’s redesign happens inside the apps themselves, at least in Apple’s native offerings. What used to look like buttons for navigating around have become plain text; the Calendar is now little more than a grid and a bunch of white space. This minimal approach, a stark contrast to the leather-stitched offerings of the past, leaves the screen uncluttered, and puts function ahead of form. If the skeuomorphic elements of iOS 6 gave the apps some heft, the raw simplicity of iOS 7 make everything feel effortless. You’ll also notice the typeface right away. It’s actually just a variation of the old font—Helvetica Neue Ultra Light versus Helvetica Neue—but it walks the fine line between newness and familiarity well. The light weight of the typeface makes way for more empty space on the screen and a general airy-ness about the OS. Along those lines, the disappearance of skeuomorphism might seem a little too airy, at first, but that’s just consequence of the overhaul. It feels natural in no time. 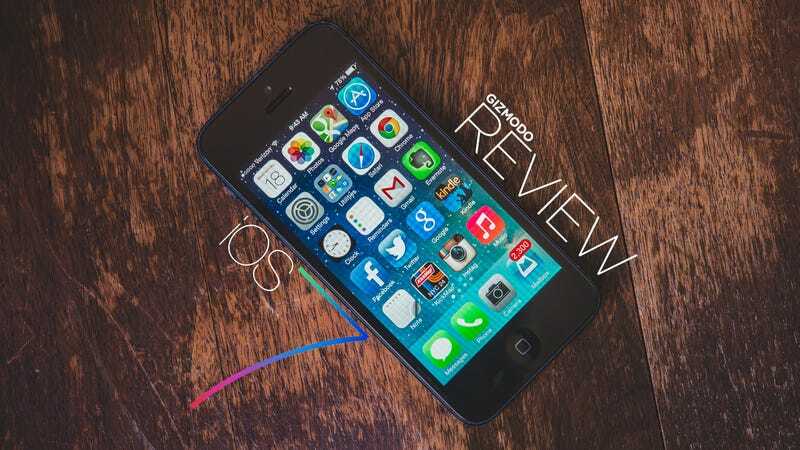 On a fundamental level, using your iPhone or iPad feels different with iOS 7. This has everything to do with slightly augmented transitions from screen-to-screen. When you open an app, you zoom in to it with the other app icons flying past you, rather than just watching it open up, as you did in iOS 6. When you close an app, the other apps fly in to take their place as you zoom back out to the home screen. It’s a simple little change, but it really makes operating system that feels more dynamic and engaging. The most dramatic updates come in the form of tweaks to Notification Center and the addition of the Control Center. The new and improved Notification Center acts more like a personal assistant than a collection of your unread text messages. Simply swiping down from the top of the phone now shows you the date, the weather, your friends with birthdays and upcoming calendar events. Meanwhile, the new Control Center truly lives up to its name, giving you control of everything from Wi-Fi to music to shared displays. Instead of having to navigate through three screens in settings, you can activate Airplane Mode or Wi-Fi from any screen with a swipe of your thumb. You can also forget about having to find just the right flashlight app, because Apple serves the feature up on a platter in the Control Center. Ditto for music controls, brightness, AirPlay and about a half dozen other features. Whether it’s because they’re such entirely new features or because they’re not actually integral to your daily iPhone life, however, I often forgot that the Notification and Control Centers exist. The lack of buttons and the introduction of layers is also transformative when it comes to using iOS 7. Earlier versions of iOS had buttons all over the place: buttons to navigate within apps, buttons to answer calls, buttons to take pictures. Heck, even the apps looked like buttons. Instead, there’s now just text. It takes some getting used to, but ultimately, it makes the phone feel cleaner. You could argue that the lack of ornamentation makes the operating system a little bit harder to use, but the learning curve is far from steep. All of the functionality is actually in the same place that it was in iOS 6—it just looks a lot cleaner. Depth is no longer just an illusion as it was in the old skeuomorphic design. It’s actually a feature of a more three-dimensional layout. Your apps float above the wallpaper, while new layers like the busy Notification Center or the translucent Control Center slide out to obscure the apps—though that frosted glass look is not for everybody. You feel like you’re floating on top of all that, navigating in and out of apps. All that said, iOS 7 isn’t just looks. Functionally, everything works better, especially the native apps, all of which got overhauled. The new features are refreshingly useful. Safari’s new unlimited tabs feature makes browsing on the phone feel more like browsing on your desktop. The sleek new Mail app makes cleaning out your inbox faster and more efficient. The Music app got welcome facelift as well as new features like iTunes Radio, which is Apple’s underwhelming but essentially satisfactory attempt at streaming music. Finally, multitasking is a cinch. Just like in iOS 6, a double tap on the home button brings up a carousel of all the apps currently running on your phone. Want to quit one? Just flick up and away. There are some new social features in iOS 7, too. The Camera app suddenly looks a little more like Instagram with a square option and now lets you add filters to your photos. Somehow, Apple’s new filters feel more cinematic than Instagram, and the camera feels a little bit faster. The accompanying Photos app organizes your pictures by moments and location (kind of like events in iPhoto) and lets you share your entire Photo Stream with friends. This is crazy convenient when you’re looking for that one picture you took of your brunch out of the 1,000-plus pictures on your Camera Roll, and sharing your whole stream is much easier than sending batches of vacation pictures to your friends. Meanwhile, the Messages app makes it easier to carry on a texting conversation with multiple people by adding profile pictures next to your friends’ texts. This a small upgrade that fixes the old problem of not knowing who’s saying what in group text messages. One thing to look out for, particularly in these early days, is that apps that aren’t yet iOS 7-optimized stand out, and not in a good way. It’s a disconnect, like seeing a Vermeer print hanging in a mod living room. That will get better as more and more developers update—you should see a rash of new looks today—but running into the holdouts is, and will continue to be, jarring. If you haven’t figured it out already, I think iOS 7 is very pretty. It’s so pretty, I found myself using my phone more in the weeks after I installed the first developer beta version. And it’s not the flashy—and frankly underwhelming—parallax effect or the technicolor palette, either. The mains strength of iOS until this point has been its ability to teach users how to use a phone as a computer. That’s been its hallmark, and what made Apple one of the most successful companies of the last five years. iOS 7 forgoes the handholding, but all of its new features still make sense without making you think too hard about it. It’s different, but it’s not opaque. You’ll surprise yourself by how quickly the redesign starts to feel familiar, and the so-called three dimensional layout makes your phone feel more powerful. Thanks to the Control Center, you can do more when the phone is locked, and thanks to the new Notification Center, everything is a little bit easier. Not much has really changed in terms of functionality. Apple just makes that functionality easier to access. All things considered, iOS 7 might be a little disorienting for some people. Apple overdid it, a little bit. The Control Center is nice, for instance, but was it really necessary to cram 17 different functions in there? How often do you really need quick access to Airplane mode? Does the stopwatch really need to be one swipe away? The same holds true for the new sharing module (which looks confusingly similar to the Control Center). There are no fewer than 13 options to choose from when you share a photo. Some people don’t even have that many close friends! Sometimes you have to squint a bit to see where to tap, because one downside of a light and airy design is that sometimes links and buttons are hard to see. And as handy as all the fancy new features are, they also do a number on the battery life. If you install iOS 7, you should probably plan on plugging in your phone at least once during the day. Fandroids will be quick to point out how the most dramatic new features for iOS were taken right out of Android’s playbook. And they were. If the idea of copycatting makes you grumble, you will have plenty to grumble at here. Then again, Apple’s been copying Android features for years, and generally in a way improves on them. Again, the battery life on iOS 7 isn’t what you want it to be. The iPhone does fine if you leave it in your pocket, but once you start surfing the web or listening to music or anything really, you can count on making it into the red in no time. Maps finally seem to have gotten a little bit better (read: fewer melting bridges). Don’t count on Apple helping you navigate public transit, though. The Maps app still lacks the ability to give directions using trains and buses. It will, however, offer you a bunch of apps that will, though, including Google Maps. Even though it’s finally baked into iOS, AirDrop sort of stinks. Your friends have to turn it on so it’ll work, and even that tiny step takes longer than it would to just send an email or a message. If you want to get the most out of your iPhone, you should download iOS 7 as soon as it’s available (or at least, after the first bug-fixing update). But be prepared for a bit of a learning curve and, yes, some confusion. The look and feel stuff will come more naturally, but you will have to relearn how you navigate certain apps and cope with shorter battery life. You’ll also have to hunt for stuff a bit, sometimes. If you’re really lost, this roadmap of sorts with all the new features should help. If you like your iPhone just fine the way it is, you might want to wait. The new features are neat and useful and all that. They are new, though. And sometimes new stuff is confusing. Sure, it’s pretty. But just because something’s pretty doesn’t mean it’s for you. So if you dig the status quo, hold on to it. iOS 6 is pretty cool, too.